A footballing priest from Burkina Faso has been sent off in a church tournament for throwing his shirt at the referee in Italy. The incident happened in the Clericus Cup over the weekend with the actions of the priest leading to Paul the Apostle's College being eliminated. Italian sports officials had expressed hopes that the tournament held at the Vatican City will help restore a positive image of football in Italy, which has been marred by recent violence. 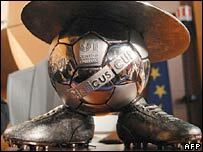 The Clericus Cup is an international football tournament including Catholic priests and seminarians. There are 16 teams made up of the various catholic colleges and church congregations in Vatican City. There is also a team made up of the Pope's bodyguards, the Swiss guards.